Blog Menopause the Musical: Hot Flashes Never Felt So Good! 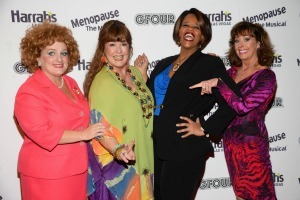 Menopause the Musical: Hot Flashes Never Felt So Good! Who ever thought a shopping spree comprised of four menopausal women could be so much fun? Those who enjoyed the longest running scripted show on The Las Vegas Strip at the Luxor will find hot flashes and flashbacks never felt so good as in this nicely revised version of Menopause the Musical at The Improv theater at Harrah’s, Las Vegas. Four women from four walks of life find that riding an elevator from floor to floor in a department store becomes more a search for sanity than for cosmetics, apparel or, as in this case, lingerie. Set to a toe-tapping, finger-snapping, chair-dancing soundtrack of parodies on classic songs of the 60s, 70s and 80s, cast members Laura Lee O’Connell (Iowa Housewife), Vita Corimbi (Earth Mother), Lisa Mack (Professional Women) and Paige O’Hara (Soap Star) clearly enjoy sharing the anguish of aging with the audience. At the grand opening at Harrah’s on February 20, media and fellow Las Vegas performers The LINQ Hotel & Casino headliner Jeff Civillico, Frederic Da Silvia from Paranormal at Bally’s Las Vegas, Ryan Stuart and Sami Eskelin from Chippendales at Rio All-Suite Hotel & Casino, Tatiana Mac, Sabrina Sia and Chelsea Reid from 50 Shades! The Parody, Ben Hale, Rob Lyons and Martin Kaye from Million Dollar Quartet, members of the cast of Sexxy at Westgate, entertainers Clint Holmes and Kelly Clinton, director and producer Bill Fayne, BMX rider Ricardo Laguna, Miss Nevada United States 2014 Lisa Song and performer Pia Zadora showed the four talented cast members of Menopause the Musical their appreciation and delight. The show ended with an enthusiastic—and well earned—standing ovation.